2 Motions of the Stars Like all objects in the sky, the stars rise in the east at an angle of 50o with the horizon, move across the sky, and set in the west (also at an angle of 50o with the horizon, here in Lancaster.) 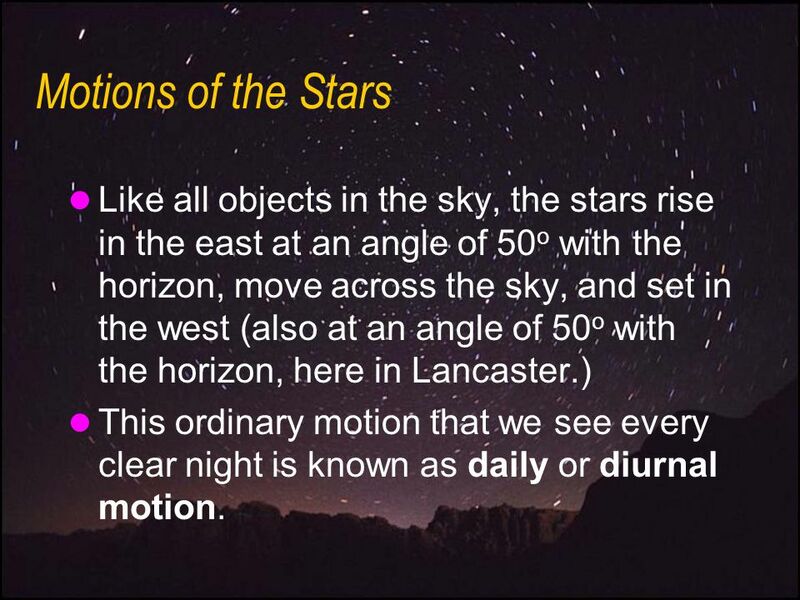 This ordinary motion that we see every clear night is known as daily or diurnal motion. 3 Motions of the Stars (2) The stars appear to rotate around the North Celestial Pole, earth’s axis of rotation projected out into space. 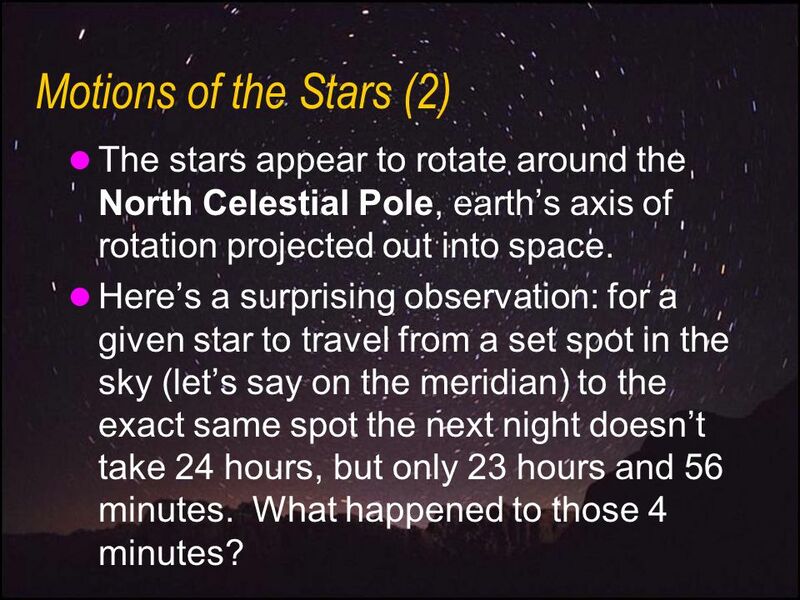 Here’s a surprising observation: for a given star to travel from a set spot in the sky (let’s say on the meridian) to the exact same spot the next night doesn’t take 24 hours, but only 23 hours and 56 minutes. What happened to those 4 minutes? 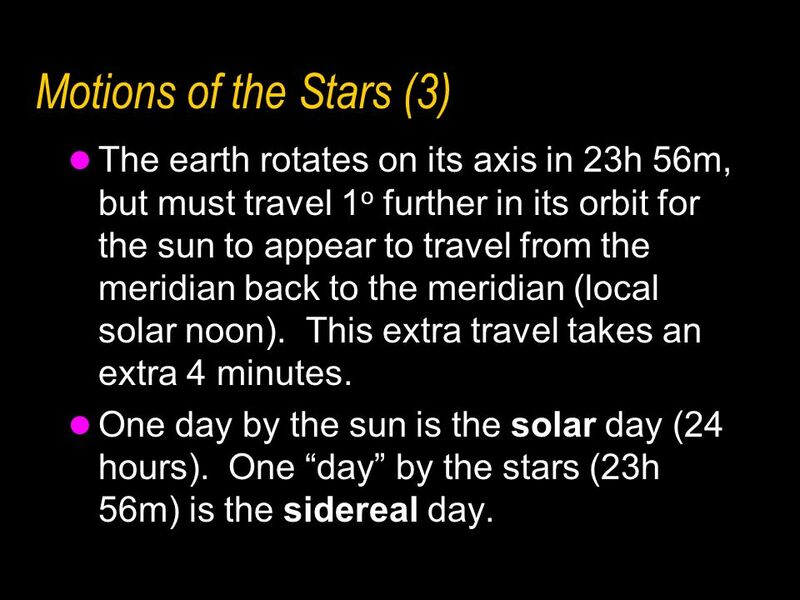 4 Motions of the Stars (3) The earth rotates on its axis in 23h 56m, but must travel 1o further in its orbit for the sun to appear to travel from the meridian back to the meridian (local solar noon). This extra travel takes an extra 4 minutes. One day by the sun is the solar day (24 hours). One “day” by the stars (23h 56m) is the sidereal day. 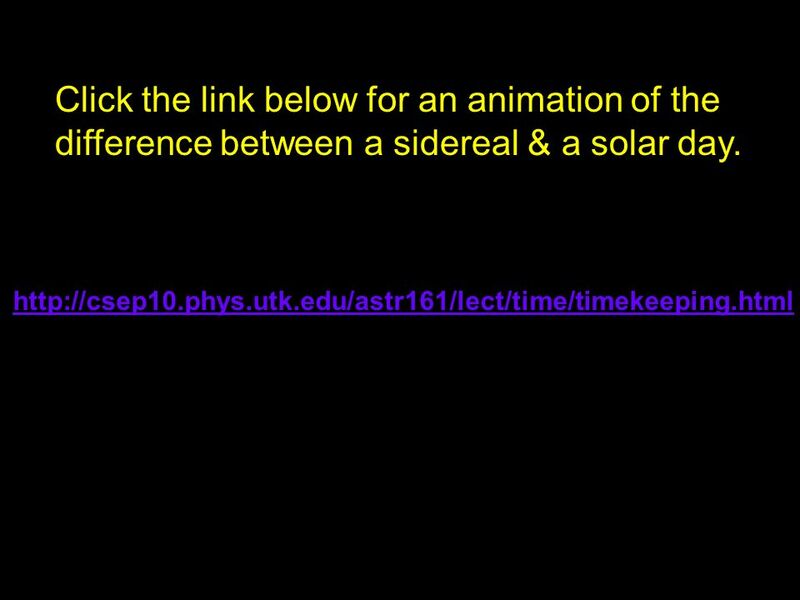 5 Click the link below for an animation of the difference between a sidereal & a solar day. 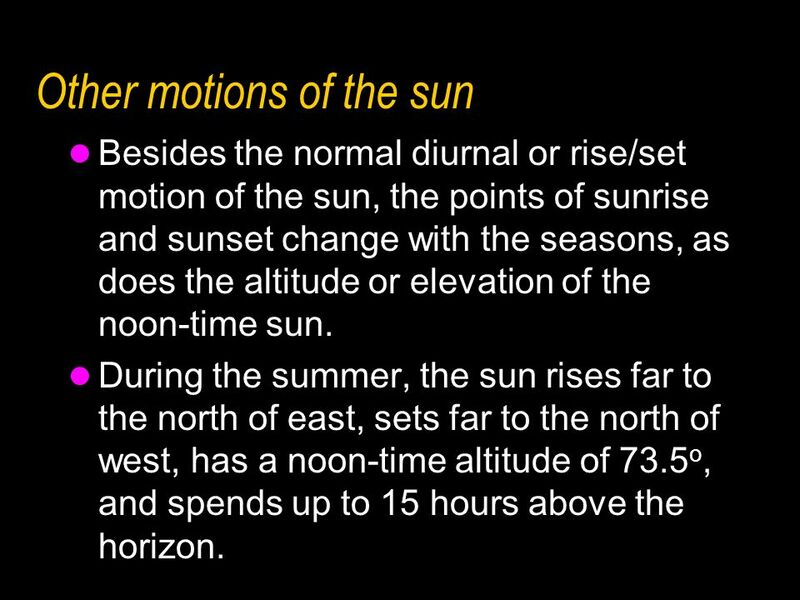 Besides the normal diurnal or rise/set motion of the sun, the points of sunrise and sunset change with the seasons, as does the altitude or elevation of the noon-time sun. During the summer, the sun rises far to the north of east, sets far to the north of west, has a noon-time altitude of 73.5o, and spends up to 15 hours above the horizon. 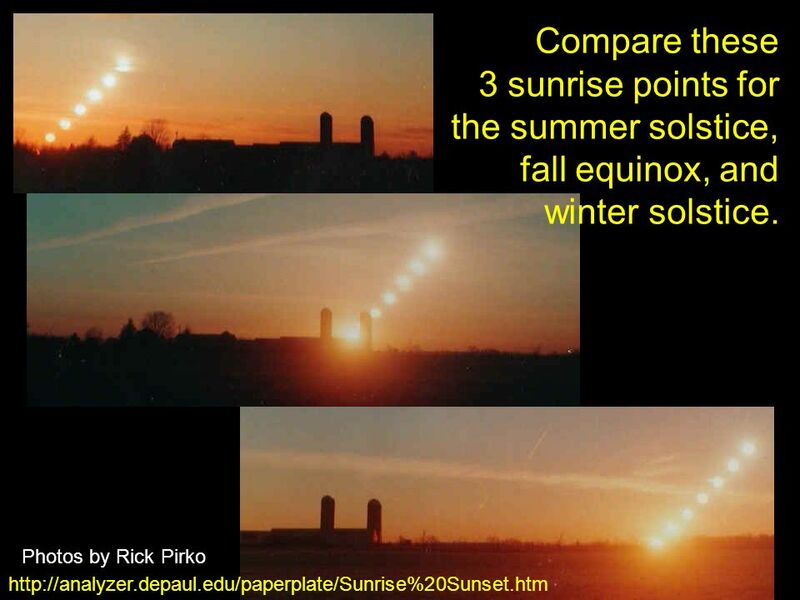 7 Compare these 3 sunrise points for the summer solstice, fall equinox, and winter solstice. 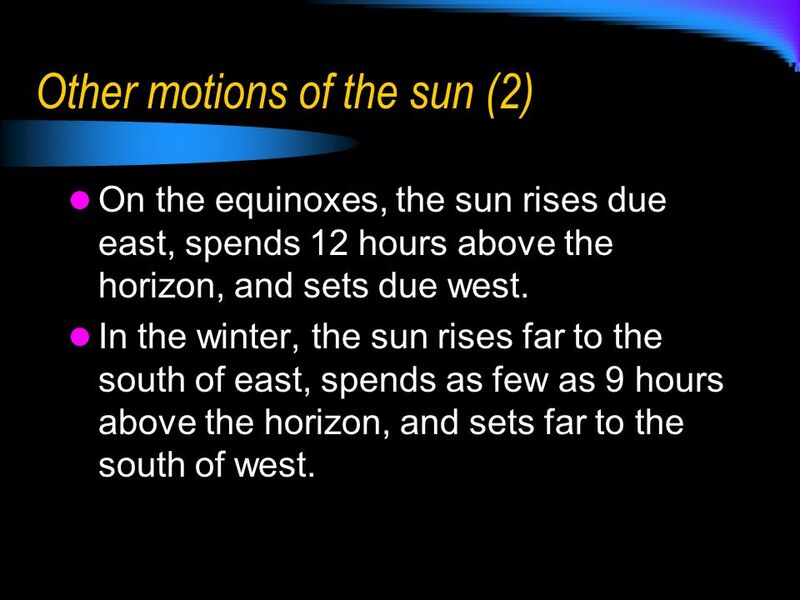 On the equinoxes, the sun rises due east, spends 12 hours above the horizon, and sets due west. In the winter, the sun rises far to the south of east, spends as few as 9 hours above the horizon, and sets far to the south of west. 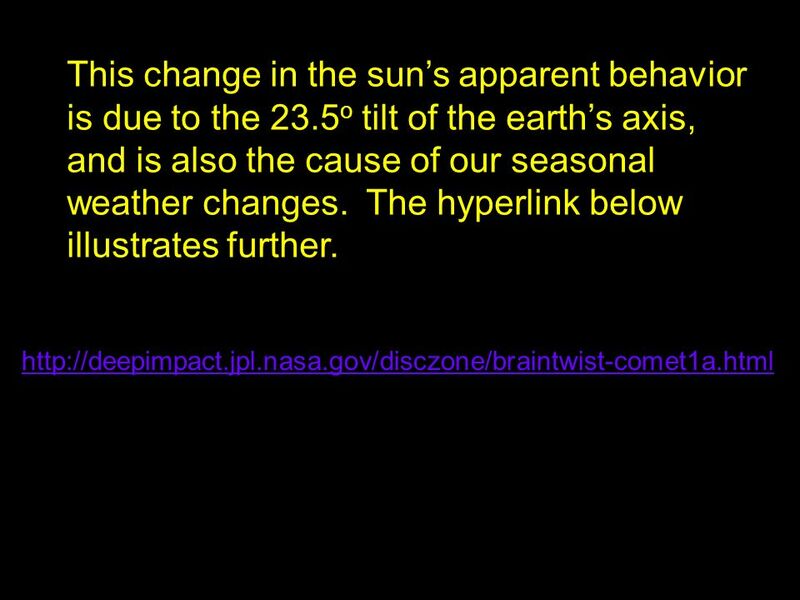 This change in the sun’s apparent behavior is due to the 23.5o tilt of the earth’s axis, and is also the cause of our seasonal weather changes. The hyperlink below illustrates further. 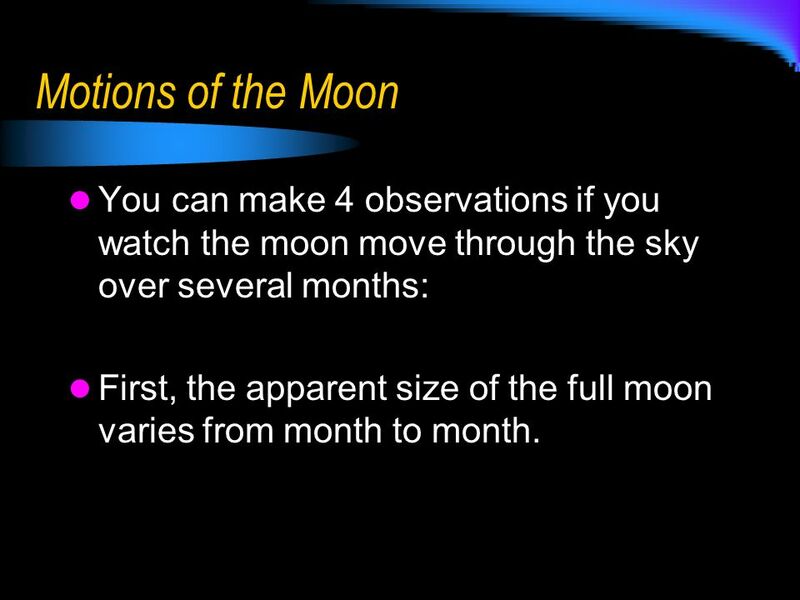 10 Motions of the Moon You can make 4 observations if you watch the moon move through the sky over several months: First, the apparent size of the full moon varies from month to month. 12 Motions of the Moon (2) From the different sizes of the full moon, we can conclude that the moon’s orbit is quite elliptical. In fact it varies by 13.3% of the average distance. 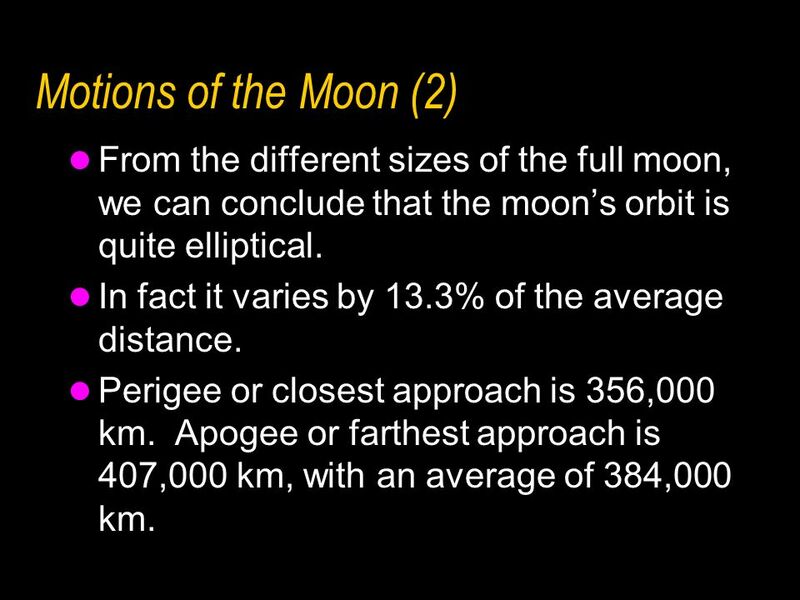 Perigee or closest approach is 356,000 km. Apogee or farthest approach is 407,000 km, with an average of 384,000 km. 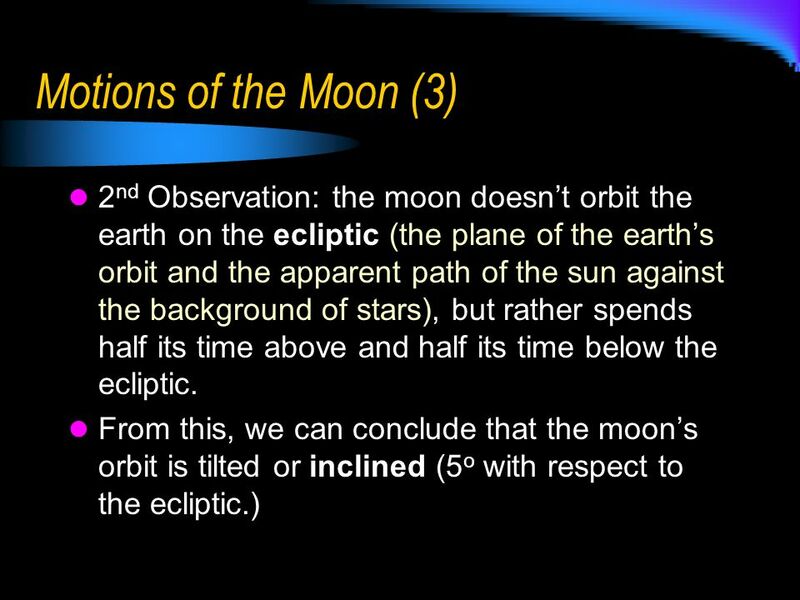 15 Motions of the Moon (4) Later, we’ll use the inclination of the moon’s orbit as a clue to its origin. 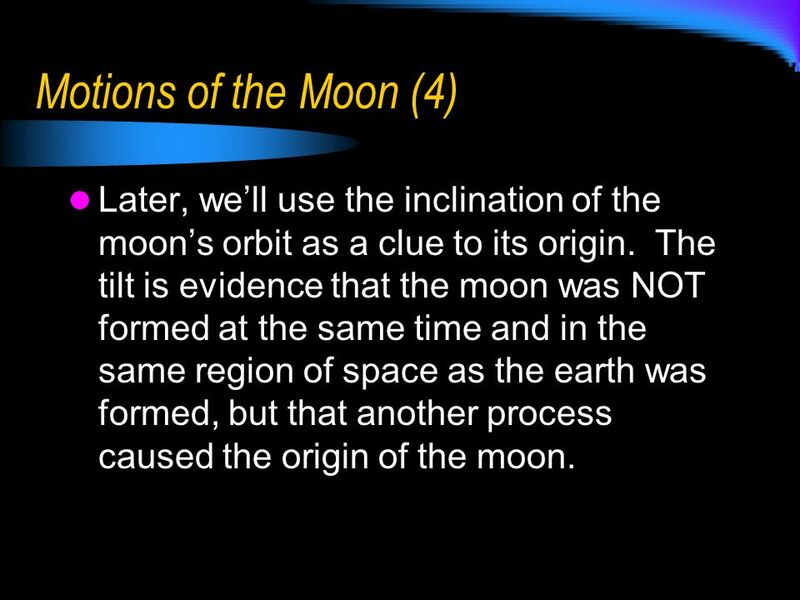 The tilt is evidence that the moon was NOT formed at the same time and in the same region of space as the earth was formed, but that another process caused the origin of the moon. 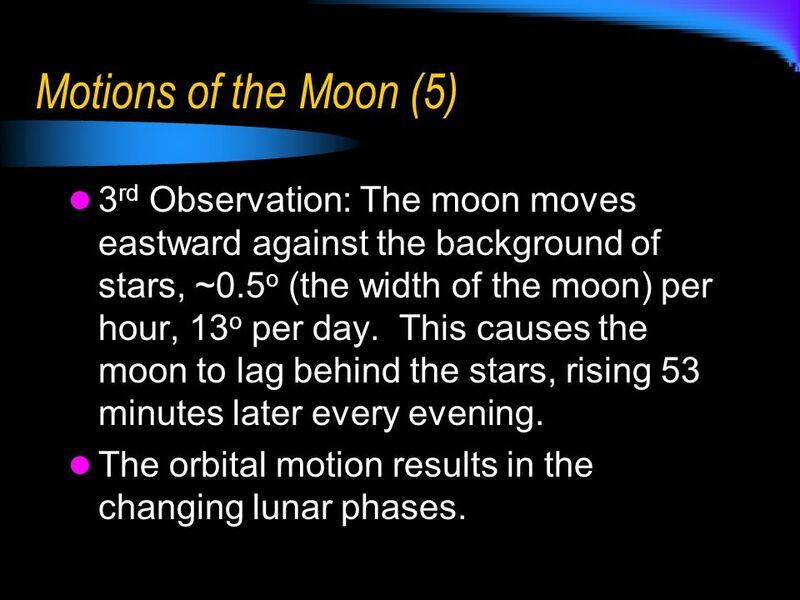 16 Motions of the Moon (5) 3rd Observation: The moon moves eastward against the background of stars, ~0.5o (the width of the moon) per hour, 13o per day. 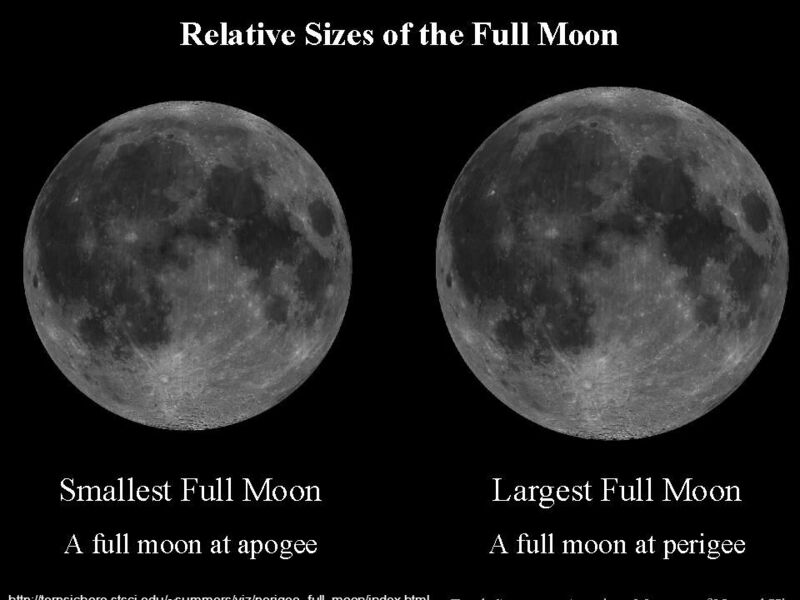 This causes the moon to lag behind the stars, rising 53 minutes later every evening. 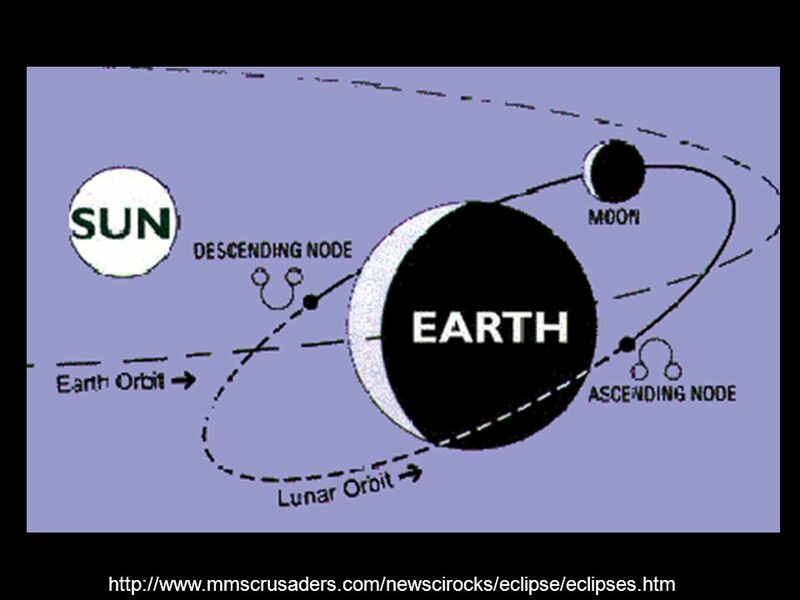 The orbital motion results in the changing lunar phases. 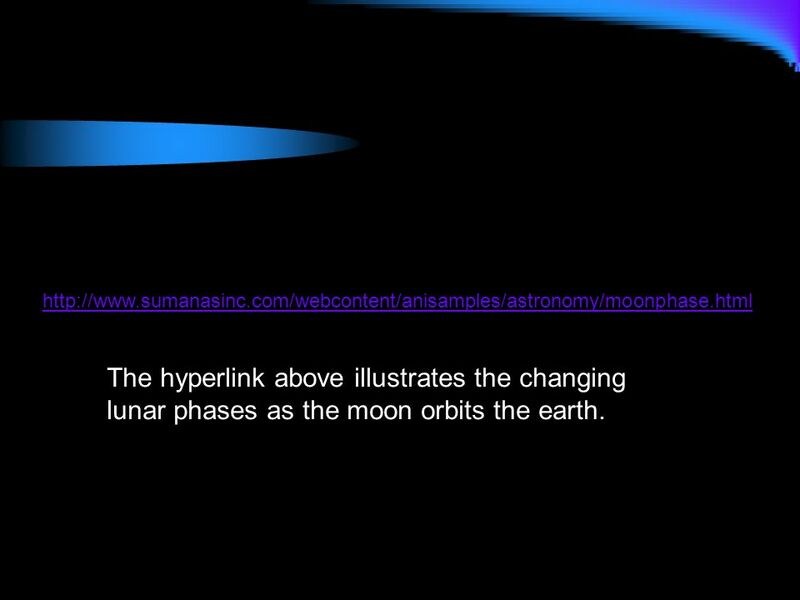 The hyperlink above illustrates the changing lunar phases as the moon orbits the earth. 18 Motions of the Moon (6) The 4th observation is that the same side of the moon always faces the earth. 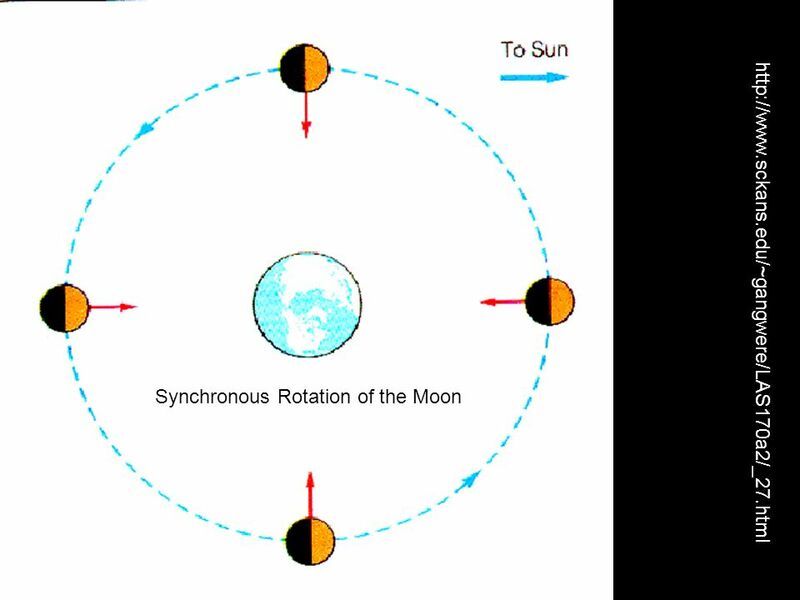 This means that the moon rotates on its axis at exactly the same rate at which it orbits the earth. We call this “locked” rotation synchronous rotation. 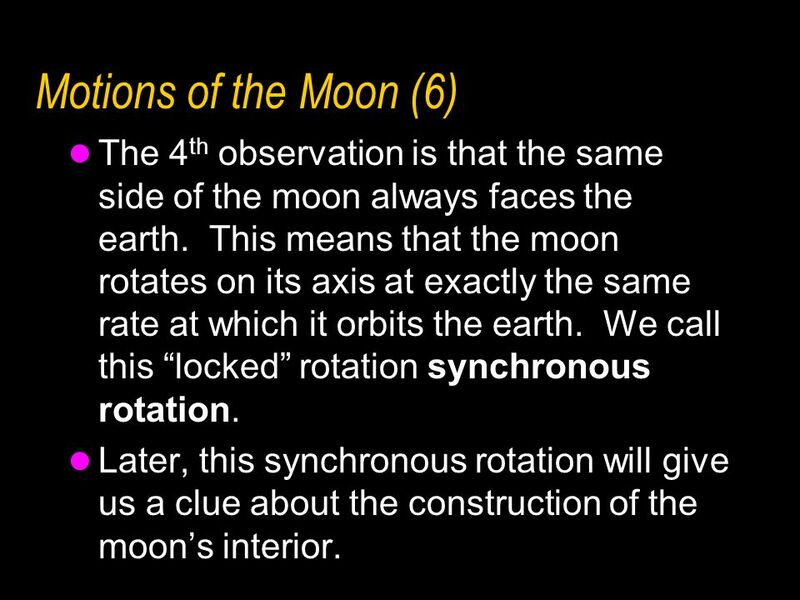 Later, this synchronous rotation will give us a clue about the construction of the moon’s interior. 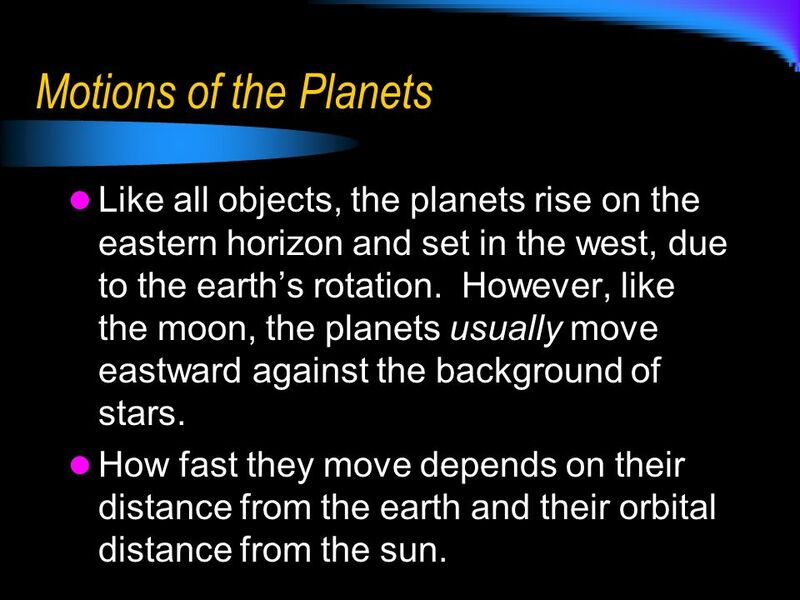 20 Motions of the Planets Like all objects, the planets rise on the eastern horizon and set in the west, due to the earth’s rotation. However, like the moon, the planets usually move eastward against the background of stars. How fast they move depends on their distance from the earth and their orbital distance from the sun. Once or more each year, however, the planets do something strange. 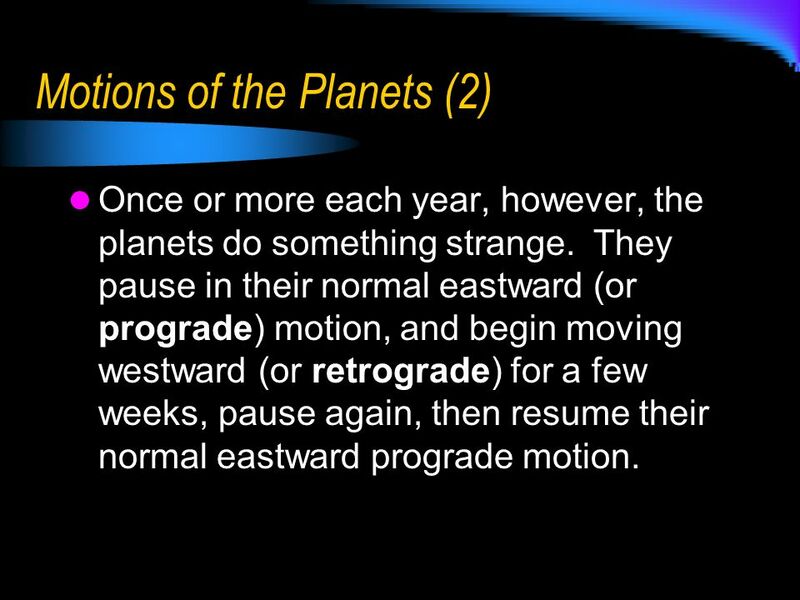 They pause in their normal eastward (or prograde) motion, and begin moving westward (or retrograde) for a few weeks, pause again, then resume their normal eastward prograde motion. Photographs of Mars, several days apart, over about a 6 month period. 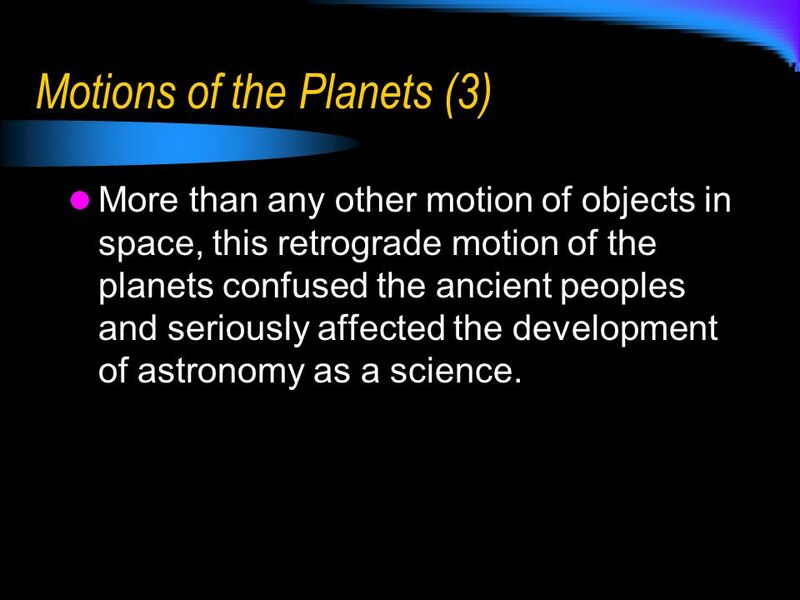 More than any other motion of objects in space, this retrograde motion of the planets confused the ancient peoples and seriously affected the development of astronomy as a science. 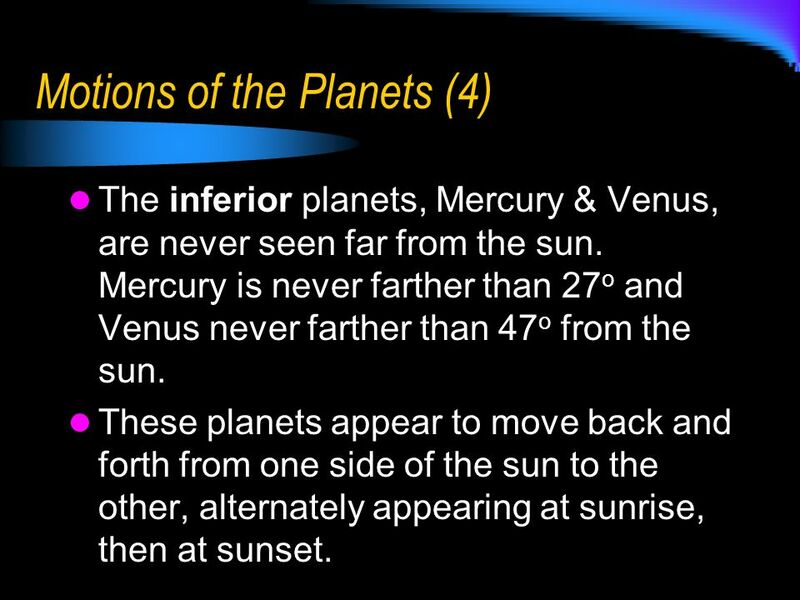 The inferior planets, Mercury & Venus, are never seen far from the sun. Mercury is never farther than 27o and Venus never farther than 47o from the sun. These planets appear to move back and forth from one side of the sun to the other, alternately appearing at sunrise, then at sunset. 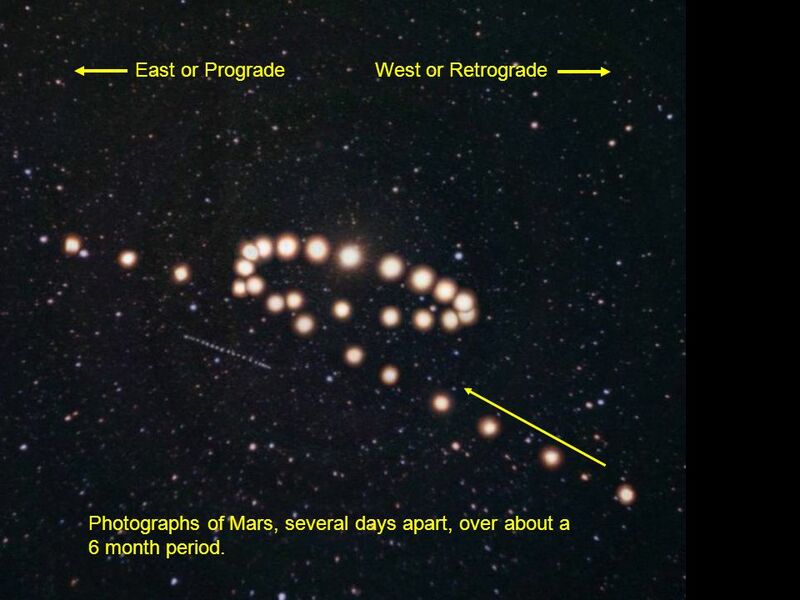 Not only are the 2 inferior planets always found near the sun, but they also exhibit phases. 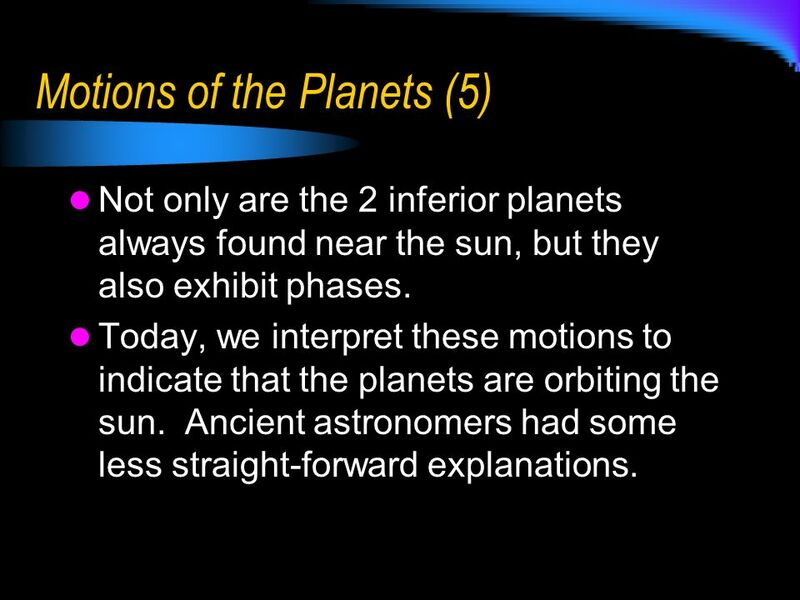 Today, we interpret these motions to indicate that the planets are orbiting the sun. Ancient astronomers had some less straight-forward explanations. 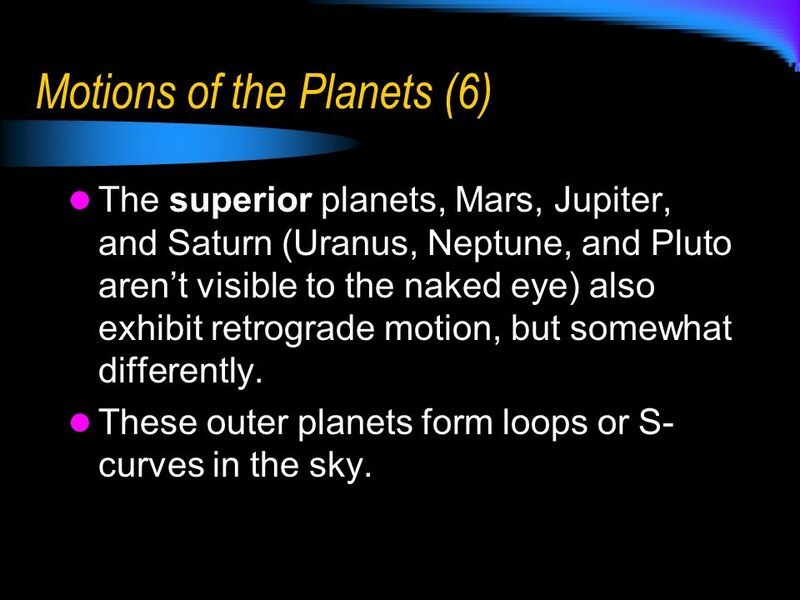 The superior planets, Mars, Jupiter, and Saturn (Uranus, Neptune, and Pluto aren’t visible to the naked eye) also exhibit retrograde motion, but somewhat differently. 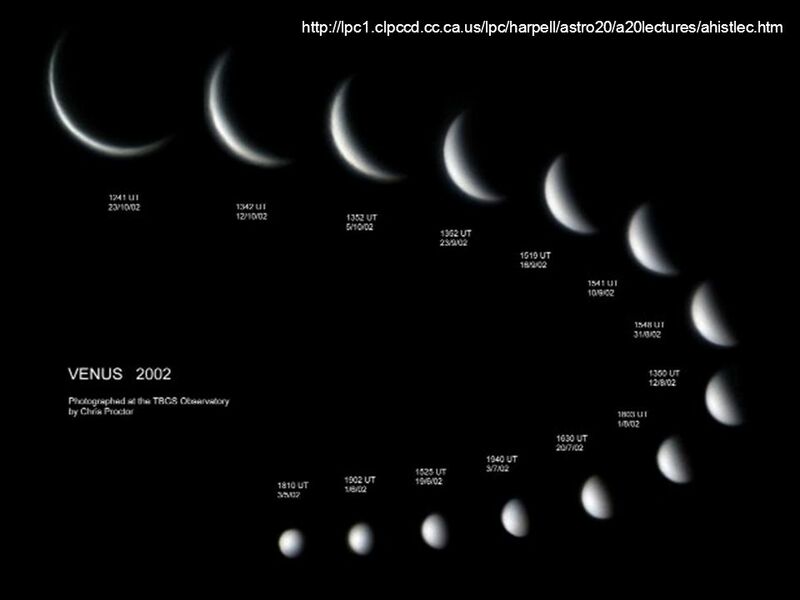 These outer planets form loops or S-curves in the sky. 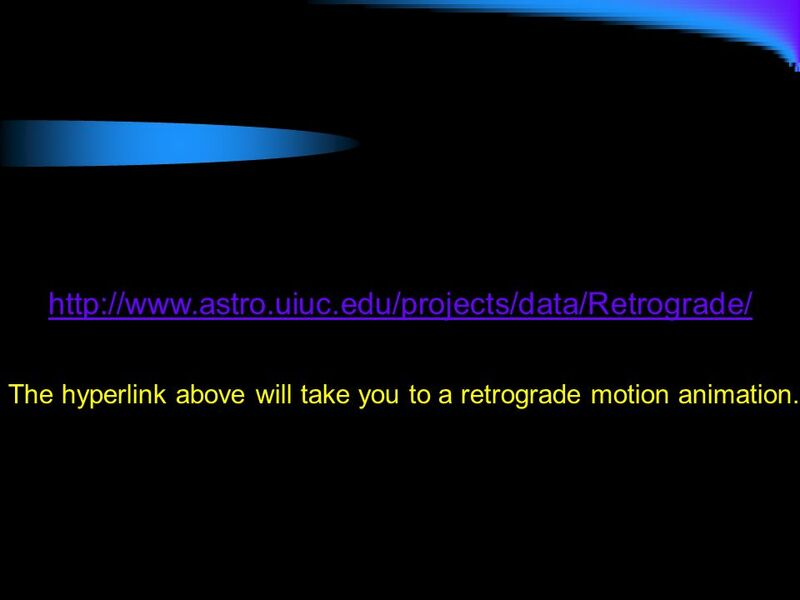 28 The hyperlink above will take you to a retrograde motion animation. 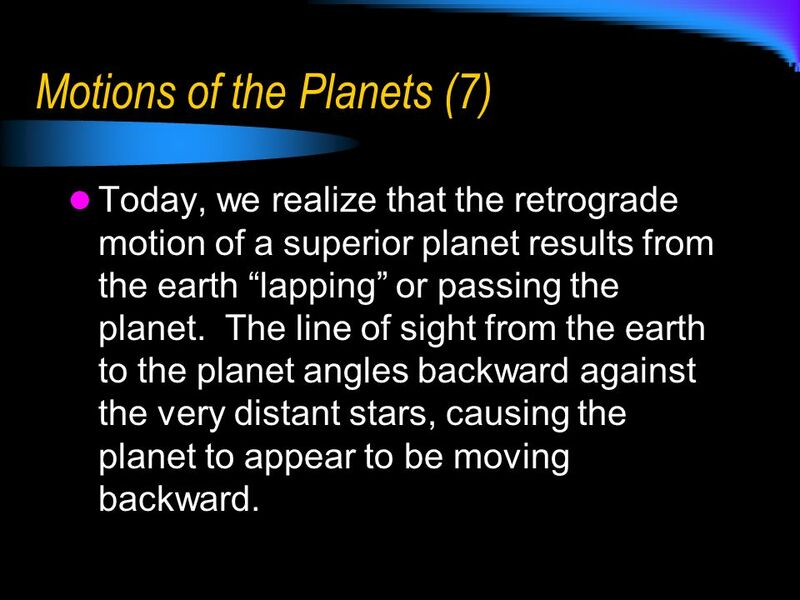 Today, we realize that the retrograde motion of a superior planet results from the earth “lapping” or passing the planet. The line of sight from the earth to the planet angles backward against the very distant stars, causing the planet to appear to be moving backward. 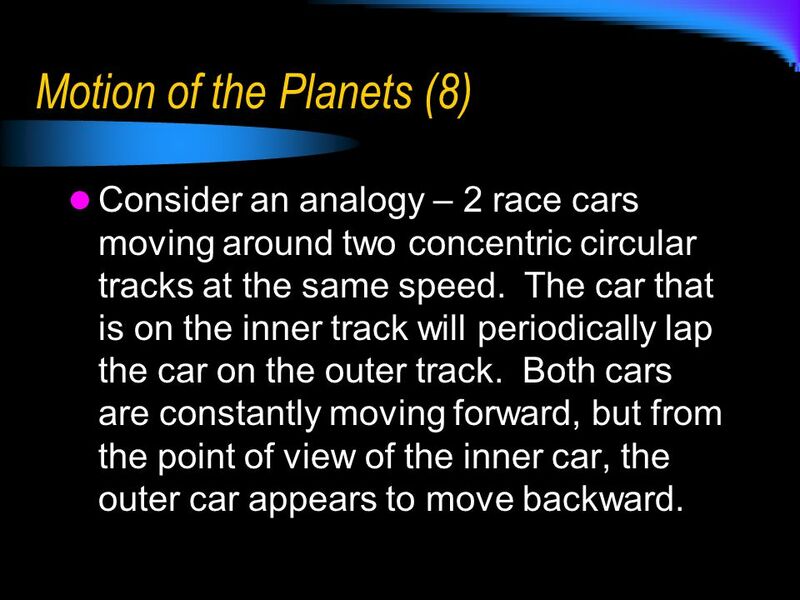 Consider an analogy – 2 race cars moving around two concentric circular tracks at the same speed. 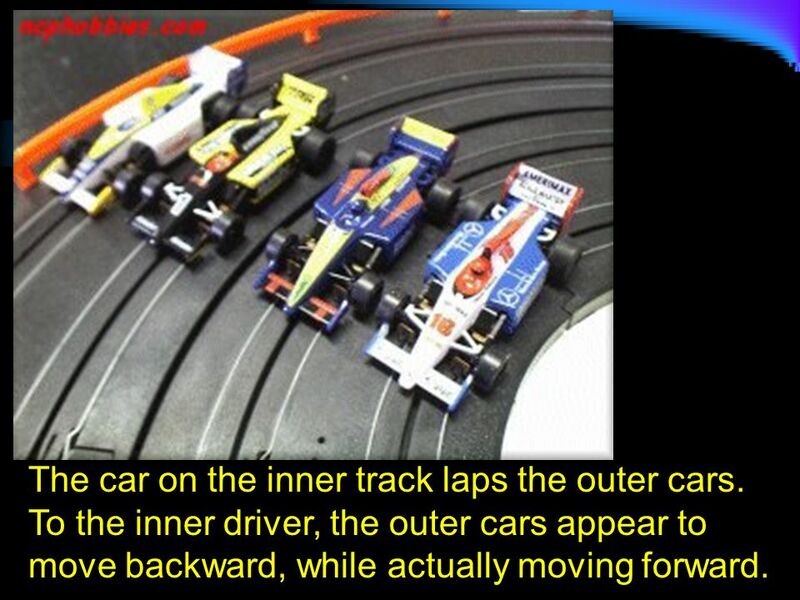 The car that is on the inner track will periodically lap the car on the outer track. Both cars are constantly moving forward, but from the point of view of the inner car, the outer car appears to move backward. The car on the inner track laps the outer cars. To the inner driver, the outer cars appear to move backward, while actually moving forward. 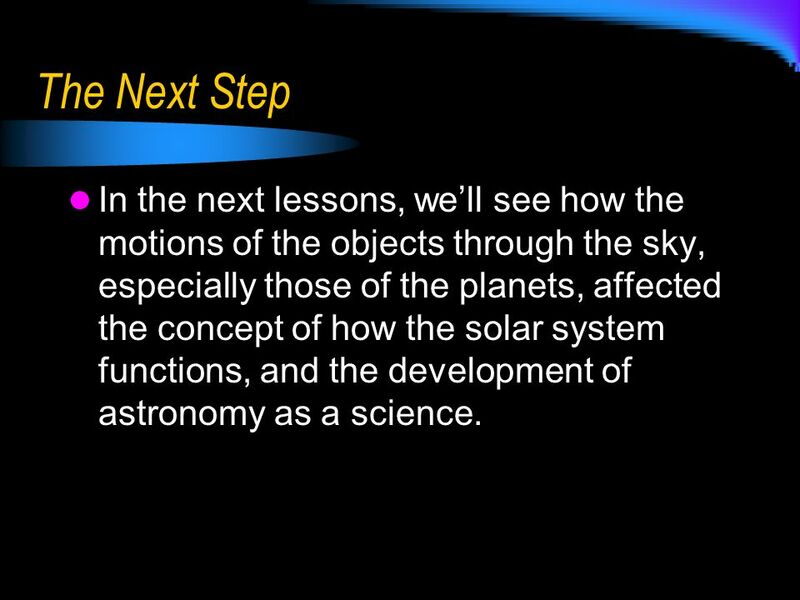 32 The Next Step In the next lessons, we’ll see how the motions of the objects through the sky, especially those of the planets, affected the concept of how the solar system functions, and the development of astronomy as a science. 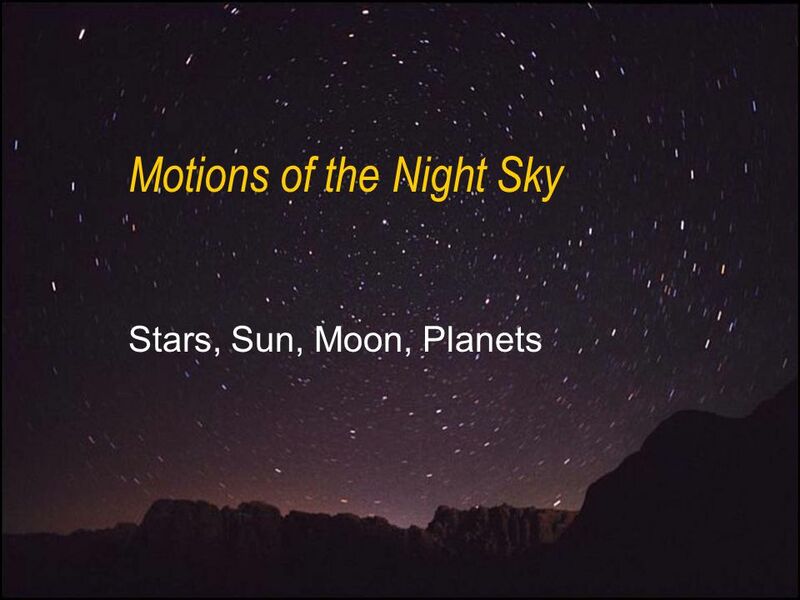 Download ppt "Motions of the Night Sky"
Knowing the Heavens Chapter Two. Chapter 3: Cycles of the Sky. Synodic vs. sidereal month If you see the Moon setting and it is full, what did the Moon look like when it was on the eastern horizon 12 hours earlier? Celestial Sphere Stars seem to be on the inner surface of a sphere surrounding the Earth. Summer, Winter, and the Tropics The Sun will be overhead on the Tropic of Cancer on the summer solstice (Northern Hemisphere), and overhead at the Equator. Cycles of the Sky Chapter 3:. The Annual Motion of the Sun Due to Earth’s revolution around the sun, the sun appears to move through the zodiacal constellations. Guiding Questions What role did astronomy play in ancient civilizations? Are the stars that make up a constellation actually close to one other? Are the. Prologue Welcome to PH109 Exploring the Universe Dr. Michael L. Cobb Fall, 2003.